Ah, we all love to cruise around on our boards, don’t we? Either it’s a standard skateboard or a longboard we love it. Whether you are riding just for fun or are looking to turn and carve on your way from one point to another, a cruiser longboard has much to offer. So the question is what’s the best longboard for cruising? For me, it’s one with the excellent build quality and performance. With a simple design, it must glide effortlessly over the pavement and most importantly it should be a good bargain for the price tag with which it comes. So let’s just get to the 7 best longboards for cruising that you can get right away. Are you looking for a perfect cruiser? 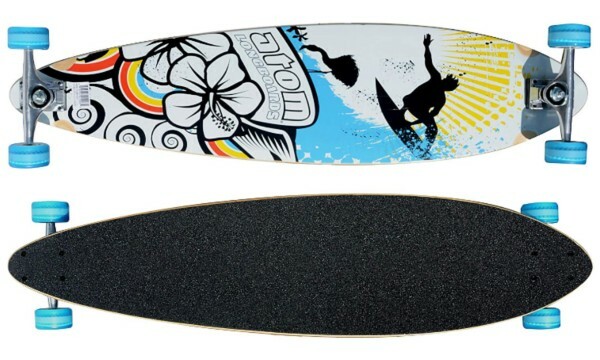 Then look no further, Ten Toes Zed longboard is the one. 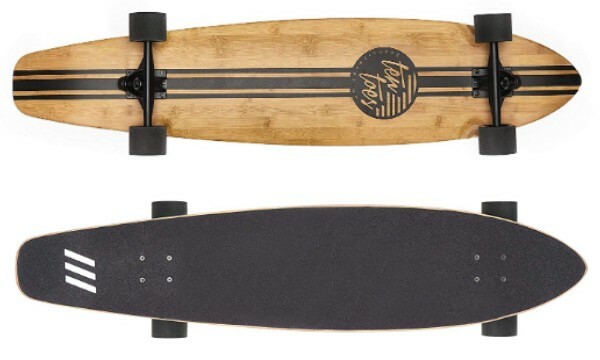 It’s the perfect longboard for cruising which ensures a smooth and comfortable ride around town, riding downhill or cruising along the boardwalk. A board that is perfect for any entry-level rider either a beginner or a pro Ten Toes Board Emporium Zed Cruiser is for you. The deck is made with 8-ply of Canadian maple and sustainable bamboo which gives the board its strength, durability, and flex suitable for beginners and more advanced riders. The deck also features anti-bite technology featuring wheel flares that eliminate the probability of wheel bite when riding at high speed and carving into sharp turns. 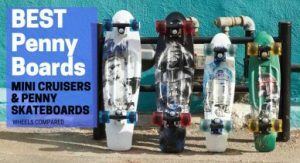 To give you more pop and surf-like ride the board comes equipped with a set of lightweight and sturdy 7-inch aluminum trucks with reactive and smooth gliding reverse kingpin. Smooth and shock absorbent Polyurethane wheels with rock finish (for superior grip) of size 70x51mm 85a are used with precision ABEC 7 bearings, providing the board its solid maneuverability and responsiveness. 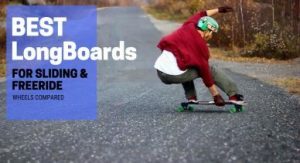 Either you are looking for good beginner longboards it fits the profile because it works on all surfaces and terrains, including pavements. With precision ball bearings it is ideal for high-speed cruising and extreme running accuracy. Zed is capable of handling all of your urban adventures! It’s a long 44-inch artisan longboard with a width of 9.45-inch. The board offers a ground clearance of 5.12 inches and weighs about 8 pounds. Featuring lightweight it makes it easy to carry around and helps in accelerating. What stands out for us is the wide range of styles and colors that Ten Toes offers. There are 12 different colors to choose from, all of which were designed right here in Los Angeles for a strikingly vintage California look. All of the boards look absolutely stunning and artistically engineered. So you’ve got plenty of designs to choose from to match your taste. There’s not much to add in the cons section that why ZED tops our list with its distinctive features. 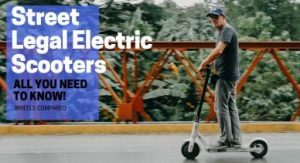 Either you are searching for affordability or a board that is perfect for cruising Zed is definitely the ultimate joyride for just the right price with top-notch build quality. Proven by its best-seller status for years, the Quest Super Cruiser Longboard is one of the most popular beginner longboards out there. That’s because the combination of cheap price, quality components, and stylish design is one that is hard to beat. I’ve still got one of the Quest’s 2012 Classic Longboard Edition in my garage, so you can bet how good is the Quest Super Cruiser. 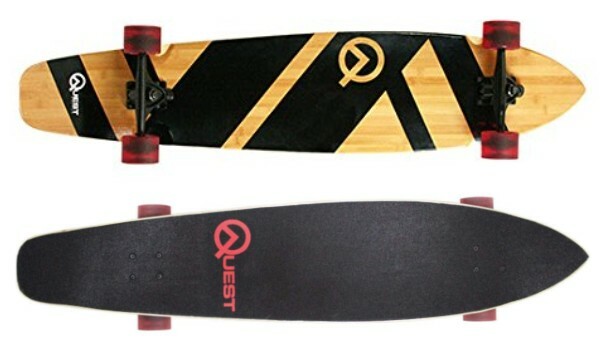 Quest Super Cruiser comes equipped with Quest’s signature multi-ply hardwood maple and beautiful artisan bamboo deck featuring a kick tail and nose along with nice cutout for wheels preventing wheel bite. The Kicktail helps in maneuvering through tight turns, promoting a steady and fun ride. 7 Ply Super-Flex bamboo, and hardwood maple gives the board its flex and makes it highly durable and lightweight making it easier to accelerate and carry around when you aren’t cursing. Aside from the deck, the board is supported by 7-inch Reverse Kingpin Aluminum trucks and hollow 4 mm risers. It uses 70 mm Polyurethane wheels with 80A (hardness level) and Genuine ABEC 7 speed bearings. This ensures a smooth and comfortable ride either for taking a spin around town, riding to school or cruising along the boardwalk. This one just makes it a perfect board for beginners to pro riders. Quest Super Cruiser is 44 inches long and 9 inches in width. The 44-inch version is optimum for riders with an average height. But for riders who are shorter than 5′ 6″, you might go for shorter 34-inch Quest Rorshack Bamboo Longboard. The Quest Super Cruiser Longboard is aesthetically pleasing due to its eye-catching, beautiful artisan design which is simply elegant with a Quest logo featuring both on the grip tape and under the deck. It’s quite rare for a board to have this kind of options at such a reasonable price with extra artisan detailing. Some beginner riders might find the board a bit too long and a little wobbly in the start. But as you get used to it, I bet you are going to love the board in everyday commute or just getting around town. Other than that Quest is the cheapest longboard out there in the market making it one of the best longboards for cruising. When thinking about high-quality longboards, people will instantly relate them to the Sector 9. The reason why it continues to be the top brand in the industry is due to its constant dedication towards excellence and its ability to manufacture high-quality premium boards. Sector 9 Fractal is a drop-through, 8 Ply maple board with a positive camber profile. Being a 36-inch board, it sits firmly in the middle of the road for a cruiser/carver deck. Other than being cambered, it’s quite flexible, and the eight ply maple makes it highly durable & sturdy. So you can bet it can take all the beating. The most distinguishing feature of Sector 9 Fractal is the Gullwing Sidewinder II’s trucks. Trucks are 9 inches wide and feature a double-kingpin design. The double kingpin design enhances the inputs of your lean, resulting in tighter turns. The board comes equipped with Sector 9 top shelf 69mm 78A wheels with PDP (Push Don’t Pollute) ABEC 5 bearings. Note: Drop-Through decks are known for their lower ground clearance which makes them extra stable due to their low center of gravity. 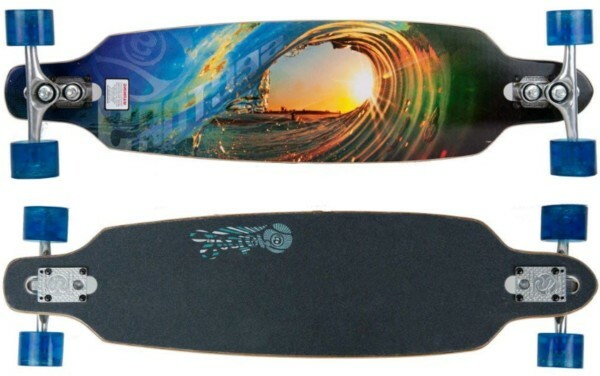 Sector 9 Fractal Complete Skateboard is 36 inches long and 9 inches wide. Providing extra stability and ease in maneuverability. The first thing to notice on the design department is the stunning visuals printed on the deck. That’s for sure gonna catch everyone’s attention. Other than this the deck is completely flat with no concave and kick tail. The board is set up so that it will ride nicely and look stunning right off the shelf. For the cons section there’s not much to it, but with that premium price tag, affordability might be the only issue. Other than that high-quality components and relatively shorter length of the board provides a surprising amount of responsiveness and makes it super fun to ride and optimum for cruising. Atom Pintail Longboard deserves your attention and money (I personally consider it one of the best under $100 options). With its classic pintail shape, it provides the perfect platform for cruising, and the wide wheelbase delivers that extra stability you want while cruising at higher speeds. It’s a perfect longboard for cruising famous for excellent build quality, comfort, and cheap price. The deck features classic, old school pintail shape, made from Canadian laminated maple with full coverage grip tape top. Featuring wheel flares (cutout for wheels in the deck) to prevent any wheel biting during carving and high-speed commute. Other than that the board has its top-mounted platform which gives the rider a more agile, responsive and livelier appeal, giving more control over the longboard trucks. Blue 65mm 78A Urethane wheels with 8.5 inches aluminum trucks are installed with ABEC 5 bearings. The solid build quality of the board provides great balance and stability that you need while cruising at higher speeds. The pintail shape used in this longboard is of big advantage, providing an aerodynamic shape and the wide wheelbase makes it a perfect platform for cruising. The Atom Pintail measures 39 inches long and 9.4-inch wide deck with a ground clearance of 6 inches. The longboard is really lightweight & weighs only 7.3 pounds that makes it optimum for carrying around and also makes it relatively easier to accelerate than the heavier 10-12 pounds longboards. It’s classic, cool and aesthetically engineered and quite rare for a longboard to have this much detail for such a reasonable price. It would be much better if the bearing were replaced with ABEC 7 instead of the ABEC 5, which is relatively slower. But at such a cheap price for a longboard, the value for money is just off the roof. If you are looking for a freestyle/multifunction longboard that’s able to perform cruising, curving, sliding, or riding downhill Playshion is definitely for you. It works for both beginners and perfectly meets the needs for kids and adults. Basically, it’s a starter longboard and offers a wide range of users and riders. 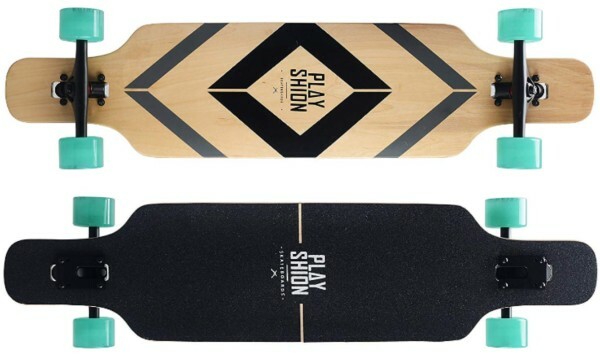 The deck of Playshion is made from 8 ply hardwood maple, providing it a sturdy feel while still maintaining a good amount of flex. From 1 to 10, we rate it 7 on flex. Due to drop through mounting technology the board stands closer to the ground with a ground clearance of 4 inches, making it more stable. The drop-through shape of the board makes it easy to brake with the right foot and easy to push because of the lower ground clearance. It uses 7-inch aluminum reverse kingpin trucks, which handles sliding easily. The board also features SHR (Super High Rebound) 78A 70 mm polyurethane wheels. Wheels are perfect for such a freestyle longboard, hard enough for firm steering yet soft enough to make a smooth ride. As the name suggests, it’s a 39-inch long board. The board weighs around 7 pounds. So, it’s a lightweight board and is easy to carry around. The cruiser comes in with a 250 lbs weight limit, so you can bet the deck can take all the beating of an adult to a young kid. My personal favorites are the one with beach and coconut trees; also one with simple line looks really dope. The only thing I found out was that the wheels were quite squeaky on the trucks and are not rust-resistant. But for a skateboard featuring all these features at such a cheap price, no one can complain. It’s quite a fun board to ride and also one of the most affordable cruising longboards market. So it’s a win-win either way! At just under the price tag of $60, Volador is the ultimate longboard cruiser that will not empty your wallet and will definitely give you the ultimate satisfaction. With an ultimate work of longboard engineering, it is the answer for a smooth and joyful ride. It’s a lightweight cruiser with ease in acceleration. So you can bet it can satisfy all your longboard freestyling needs either its downhill riding or cruising around town, it’s the best out there. The Volador features an 8-ply hard maple deck cold pressed into a camber concave, which gives its sturdy and solid feel yet maintaining the flex of the board. The deck is quite durable and provides amazing physical performances like super flexible, shock absorbent, and unsurpassed in strength. The nice cutout (Wheels Flares) in the deck avoids wheel bite from any angle, hence enables you to take extreme turns and enhances the maneuverability of the board either you are riding down the hill or just cruising along the boardwalk. Volador features high build quality materials, like genuine aluminum alloy trucks, carbon steel bolts, chrome steel bearings, high rebound PU wheels. The 7-Inch aluminum reverse kingpin trucks are adjustable (45 degrees by default and can be adjusted to 50 degrees) which makes the cruiser shock absorbent and serves as a perfect cruiser for hours, offering a comfortable and joyful ride. Tip: Flip trucks angle to 50 degrees, lubricate the bearings, and you’ll be amazed when your board cuts corners like a beast. It’s turning accuracy and responsiveness always standby for your riding trip. Volador is 42 inches long and features 9-Inch (width) spacious deck. Riders get a 34-Inch Wheelbase. Volador comes equipped with durable 70mm x 51mm 78A Polyurethane wheels with precision ABEC 9 bearings, ensuring a smooth riding experience with ultra-low bearings rolling resistance. For Volador quality is the first concern, and the artwork is the second one. With ideas collected from designers of different cultures, Volador took care of people with different tastes, featuring a wide range of different styles to choose from (12 to be exact). The bottom graphics are highly durable, and will never fade with time. 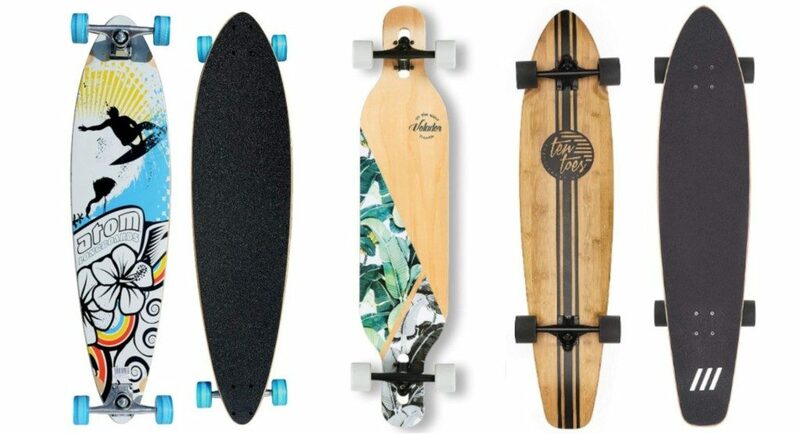 With all these options available you might find longboard suitable for girls, boys, kids, undergraduates, or 1970’s old school riders. 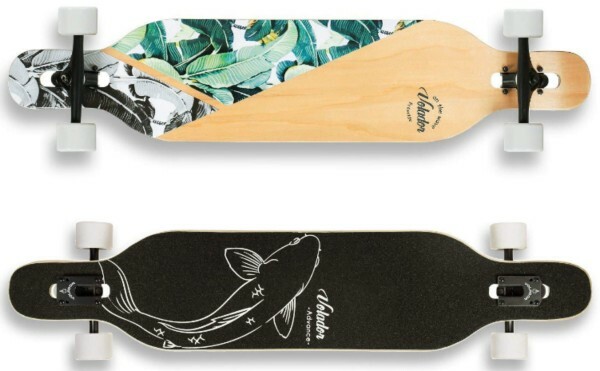 The grip tape is not that durable, so the probability of fading or wrinkling after a long period of use is there, but you can change at any time when you don’t feel comfortable using it. Hit me up if you need any suggestions for replacing the grip tape or any help. Other than that you can bet that Volador is as good to ride as good as it looks. And the value it offers for the money is just insane. VOLADOR 42 Inch Freeride Longboard Complete Cruiser also comes with aftermarket customer support, so all you need to do is let them know your problems or any suggestions that you have and a member form Volador team will follow you up. Need to know more about Volador Freeride Longboard? Checkout our Full Reivew on Volador Freeride Longboard. 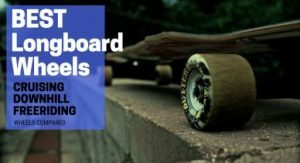 Rimable out of all Drop-through longboards is my personal favorite with an excellent option for those who are in search of a reliable drop-through longboard, with its ability to fulfill all the crazy demands of the user. 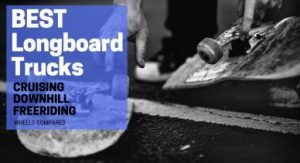 It’s one of the best Drop-through boards to try out different skateboarding styles like cruising, freestyle, freeride and downhill. RIMABLE Drop-through Longboard offers a sturdy (strongly and solidly built) deck, which is made up of cold pressed 9 ply Canadian Maple. It’s a solid deck that can support heavier riders with ease. The deck is a fine example of RIMABLE dedication towards achieving excellence as you will also notice how effective it is if you want to experiment RIMABLE Drop-through Longboard with various cruising techniques and any riding style. Aside from that, Rimable comes installed with 7-Inch Aluminum trucks that boost its sturdiness and robustness as well as an 80AB grip tape. The trucks are easy to balance while promoting ease in letting the wheels run smoothly and ride speedily. Other than that 70mm X 51mm Polyurethane wheels with 85A hardness, equipped with precision ABEC 9 bearings with high-speed lubricant fit well with the wheels which help to increase the speed, resulting in less rolling friction between the bearings. For me, their performance is 10X better than the regular bearings and ensures stability & a smooth ride. 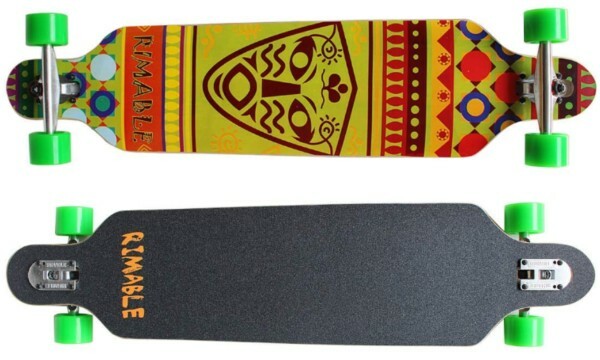 RIMABLE Drop-through Longboard features a deck which is 41 inches long and 0.5 inches wide. The board weighs around 8 pounds and has a ground clearance of 4.3 inches that is enabled by its unique drop-through technology enables a lower center of gravity meaning more control for the rider & higher maneuverability. It’s classic, cool and aesthetically engineered. If you want a board that performs as well as it looks Rimable is the one. Rimable is a perfect longboard for cruising the only thing I noticed when I was testing was that the wheels are prone to accumulating dirt fast, other than that I totally loved it while cruising down the road. It is highly recommended for anyone who is into cruising. With an excellent build quality offered at an insanely reasonable price, the value per dollar ratio is just through the roof! There you have some of the best longboards for cruising in 2018. Now, it’s really up to you to choose a longboard that really meets all your cruising needs. I’ll narrow it down a bit more for you! Cruiser boards are designed to usually have softer wheels, featuring more flexible decks for easier pumping. So go for boards that offer greater stability and easy rolling, as well as good balance. Aside from this, you can hit me up in the comments section for suggestions; I’ll be more than happy to help you!